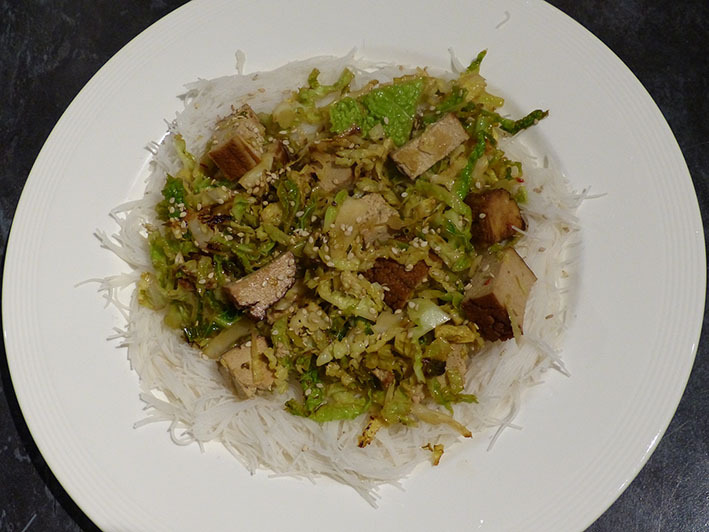 A simple recipe with seasonal cabbage and noodles. Serve with fried banana for a sweet twist. Heat the 2 tbsp of oil in a large pan. Add the tofu and fry for about 8 minutes until browned. Add the cabbage, lemon juice and soy sauce and stir-fry for another 15 minutes until the cabbage is tender. Cook the noodles following the instructions on the packet. In the meantime, heat the rest of the sunflower oil and bake the bananas on each side until slightly browned. Add the cooked noodles to the cabbage and tofu and mix together. Sprinkle each plate with 1tbsp sesame seeds. Serve with the baked bananas.